Today marks the 800th anniversary of the signing of the Magna Carta. 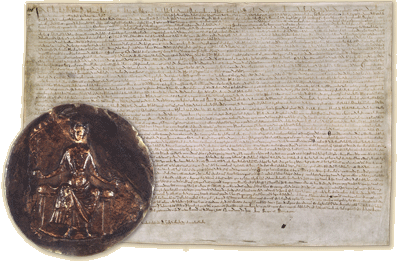 There are articles about this everywhere, but for those who have managed to miss them, the Magna Carta was a charter originally signed (or rather, sealed) by King John, which set in stone certain fundamental rights of law, and limited the power of the King so that he was no longer above the law. This was a radical move, and in fact, the charter was signed under a certain amount of duress, nobody stood by its commitments, and it was quickly annulled by the Pope… Still, it had great symbolic as well as practical value, and after John’s death in 1216 it was rewritten several times, was part of a treaty in 1217, and in 1297 it became part of England’s statute law. It is considered to be one of the foundations of our legal system. Disclaimer: I’ve never studied law, so do not expect great legal insights from this post. On the other hand, I did major in medieval history, so if you find history intensely boring (how can this be? ), you might want to skip the next three paragraphs. I promise we’ll get to the politics/law stuff after that. My first degree was in history – medieval history to be precise. My reason for choosing medieval history was straightforward: I have always enjoyed reading primary sources, because of the way languages and customs change but people are still pretty much the same in any given time, and I especially loved the way chroniclers of those times made no attempt whatsoever to be objective. Objectivity wasn’t their job – these chroniclers were there to tell a story and point the moral and tell you who was good and who was bad and who jumped over a fence while chasing pigs and turned from a girl into a boy (I would footnote this if I could, but my degree is nearly twenty years old now – I remember the story, but not the source). They were there to edify as much as to educate.